Nabors Garage Doors is your Top Rated Local® Garage Door Contractor in Fayetteville, Georgia and the surrounding area. We are proud to offer our clients a comprehensive range of garage door services including installations, replacement, repairs, tune-ups, and garage door opener installation, and repair. Your garage doors are not only an essential part of your home’s aesthetic value, they are an important part of its functionality as well. Properly functioning garage doors will provide your home and vehicle with protection from theft and extreme weather. Contact us today if you’re ready to get started. 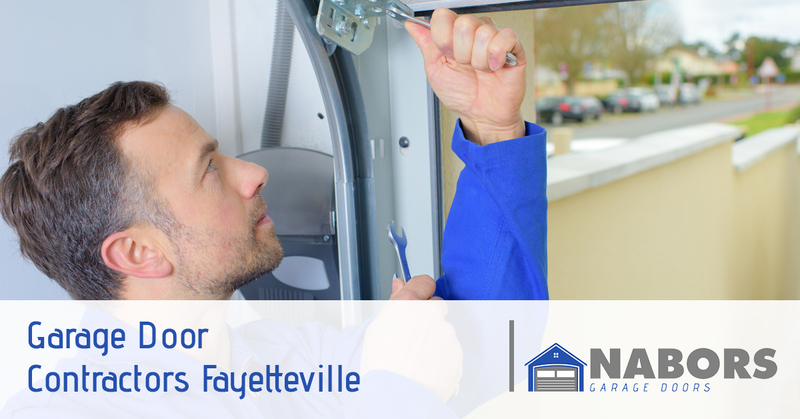 Our top priority at Nabors Garage Doors is to provide you and your family with comprehensive garage door services for your Fayetteville home. We are transparent about all of our services so you know exactly what you’re getting, and if you find a lower price anywhere in the area, we will match it! Are your garage doors looking old, worn, and outdated? Nabors is happy to consult with you about your options for garage door replacement. We’ll walk you through the pros and cons of each garage door including durability, aesthetic appeal, longevity, and cost, then get your new garage door installed in a timely manner while working around your busy schedule. Although most modern garage doors are designed to be durable and last as long as possible, you may find that a component in your garage door has stopped working or doesn’t work like it used to. If this leaves your garage door stuck open or partly open, you’ll need a reputable garage door repair company to fix it as soon as possible. Contact Nabors anytime of day or night and we’ll rush to your location to fix the issue. Whether you need a new garage door opener installed or repaired, Nabors has got you covered. We are a proud supplier of the Elite Series® and Premium Series® garage door openers by Liftmaster, the most reputable garage door opener brand on the market. We will also repair your garage door opener, no matter the brand or the model. Whether there is a simple connection issue between your remote and the device, or it’s a more complex issue that requires us to special order components, we’re here to help. It’s important that you get these issues fixed quickly so that they don’t lead to other issues and could leave your home vulnerable to theft or extreme weather conditions. We’re always on standby to help you, whatever you need. When it comes to garage door installation and repair, you can’t afford to trust a garage door contractor that doesn’t have your best interest in mind. Nabors is a family-owned and operated company that is proud to serve our neighbors in the Fayetteville area. We’re always here for you when you need us, so give us a call today to get started.